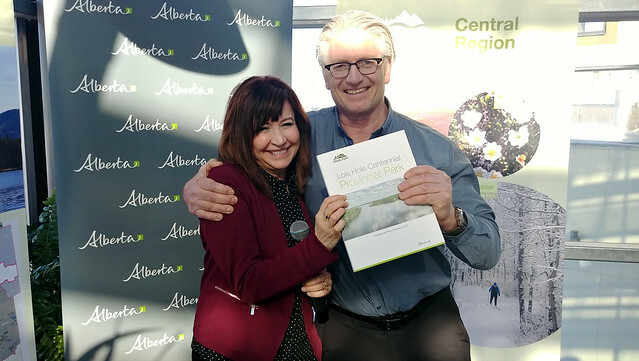 St. Albert MLA Marie Renaud presents Jim Hole with a copy of the Lois Hole Centennial Provincial Park Management Plan. The popular park on the edge of St. Albert is globally recognized as an important bird and biodiversity area that supports recreation opportunities like hiking and bird-watching. The Government of Alberta is investing $160,000 under the Lois Hole Centennial Provincial Park Management Plan to support the facility improvements and the development of a new nature trail. The management plan also builds on recent inclusion and accessibility investments, including last year’s upgrades to the John E. Poole boardwalk inclusion trail and parking lot. The park is named after Alberta’s 15th lieutenant-governor, Lois Hole, a beloved businesswoman, academic, professional gardener and best-selling author of more than a dozen gardening guides. Hole passed away in 2005, and the park was established to honour her legacy and accomplishments. Future opportunities identified in the plan include development of a day-use area, additional trails and collaborative monitoring and stewardship programs to protect the park’s sensitive ecosystem. The plan supports nature-based education and maintains the park’s status as a globally recognized Important Bird Area which draws visitors from far and wide. The park’s John E. Poole Wetland plays an important role in helping Ducks Unlimited Canada advance conservation in Alberta. Lois Hole Centennial Provincial Park was designated on April 19, 2005, in honour of the late lieutenant-governor Lois Hole. The dominant feature of Lois Hole Centennial Provincial Park is Big Lake, which makes up about 60 per cent of the park. The park is recognized as a globally significant Important Bird Area for its abundant and diverse bird populations, especially waterfowl and shorebirds. Through a memorandum-of-understanding with Alberta Parks, Ducks Unlimited Canada has constructed interpretive boardwalks to educate visitors about the sensitive ecology of the area. There is a wildlife viewing platform along the eastern shore of Big Lake at the mouth of the Sturgeon River.